During Christmas I watched as my son Carson played with his toys, making believe he was a great hunter out to capture dinosaurs. It took me back to my own youth. I often pretended to be a policeman, fireman, or soldier, much like many of you probably did. To the best of my memory however, I never recall playing ag teacher. “What are we doing in class today”? Who has heard that question recently? It has been exactly 194 days since I left the ag classroom to move to South Dakota. Not a day has gone by that I have not missed my former students. Ag Education is more than teaching valuable life skills through agriculture. It is about making connections and being a role model. Ag teachers make an impact every day. National Teach Ag Day is a celebration of agricultural education. If you are interested in becoming a stronger advocate for agricultural education, or have just always wanted more insight into how the legislative process works, consider attending the ACTE National Policy Seminar in Washington DC, March 8-10. 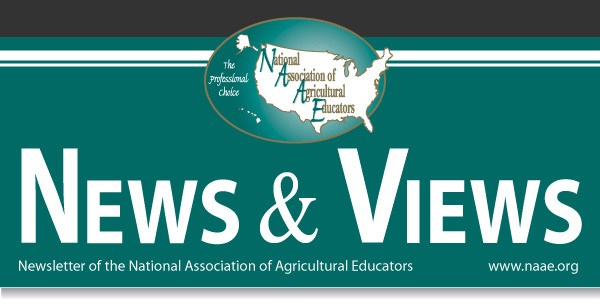 The ACTE NPS provides an excellent opportunity to learn the basics of influencing federal decision makers on legislation related to career and technical education, including agricultural education. NAAE is also planning an Ag Ed strand with NPS that will include a dinner session (sponsored by Cargill, as a special project of the National FFA Foundation) and other agriculture-specific activities especially for the NAAE members who attend the NPS. James McCormack, ag teacher at Oran High School in Oran, Mo., has come up with a unique way to give students in his shop class the opportunity to learn several skills in a single fun project.